Next Day – Orders for Next Day Delivery that are received before 2pm ET, Monday through Friday, will ship the same day and deliver the next business day. Saturday and Sunday are not considered business days. Orders received after 2pm ET on Friday or anytime on Saturday or Sunday will not ship until Monday and will be delivered on Tuesday. If you need Saturday delivery please call us at 888-252-6567. 2nd Day – Orders for Second Day Delivery that are received before 2pm ET, will ship the same day and deliver in 2 business days. Please note, Saturday and Sunday are not considered business days. Orders received after 2pm on Wednesday will not be delivered until Monday. Orders received after 2pm on Thursday will not be delivered until Tuesday. If you need Saturday delivery , please call us at 888-252-6567. Yes we do! Just order online as usual. Once you have items in your cart you can click on “view cart” and use the shipping calculator to see your shipping costs. Shipping costs do not include any custom fees or import taxes. Customs fees/taxes vary depending on local regulations and can only be paid at the destination by the customer. Please insure that the phone and email information are correct so customs may contact you. Customs processing time can create delays in shipping time. Do You Ship Internationally other than Canada? We do ship internationally through our Ebay site. We get a better discount on international shipping and you get the security of using a large company like Ebay. Just click on this Ebay link and you can see our products. You can click on any item and then click on “see details” next to shipping. Enter your country and postal code to see the shipping charges and estimated ship time. We look forward to working with you. Whether you call it Color Powder, Colored Chalk, Colored Dust, Holi Powder, Holi Colors etc., it is essentially the same thing. Bright, vibrant powder used to throw at Holi Festivals, Fun Runs, Color Wars and other events. Our Color Powder is made from a blend of food grade cornstarch, FD&C and D&C dyes (food, drug and cosmetic dyes) and baking soda. How Much Color Powder is Needed For A Fun Run or Color Race? How Much Color Powder is Needed For A Color War? 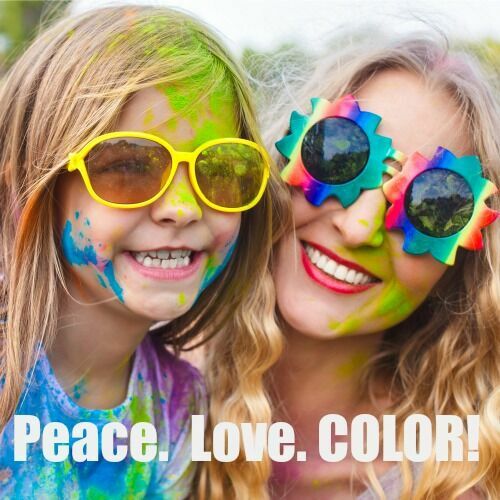 There are a lot of variables in a color war – what type of game are you playing, how you disperse the powder etc. The color can go very quickly. For Color Wars we generally recommend 1 pound of powder or more per participant for best results, however, you can get by with a minimum of 1/2 pound per participant if your budget does not allow for 1 pound of color powder. We have some great ideas for Youth Ministry/Youth Camp color powder games on our blog. How Much Color Powder Do I Need For Other Events? For other events such as gender reveal parties, birthday parties, festivals, pep rallies and photo shoots it depends on what you are planning to do. Call us for more detailed information about your colored powder needs: 888-252-6567. Yes! We accept purchase orders! If you are a school or organization with a valid tax id# you can fill out our Purchase Order Quote Request Form or give us a call 888-252-6567 and we will be happy to provide you with a quote in order to facilitate the purchase order process. Does Color Powder Contain Gluten? Our color powder is gluten free. Is Color Powder harmful if you inhale it? Although all the materials are food grade we do not recommend inhaling large quantities of color powder.It should always be used in well ventilated outdoor space and when throwing at participants you should aim for the chest area. Anyone who has asthma, is allergic to any of the ingredients or has any respiratory issues should exercise caution when participating in color powder events. Does Color Powder Stain Clothing? Our color powder washes out of most clothing. However, it can stain some materials. 100% cotton clothing is recommended and typical machine washing with stain remover, removes the stains. We recommend removing excess powder from clothing before washing and/or applying water. How Do I Keep the Color in My Shirt From A Color Fun Run? While some people are concerned with making sure that the color washes out of clothing others want to show off their colors. 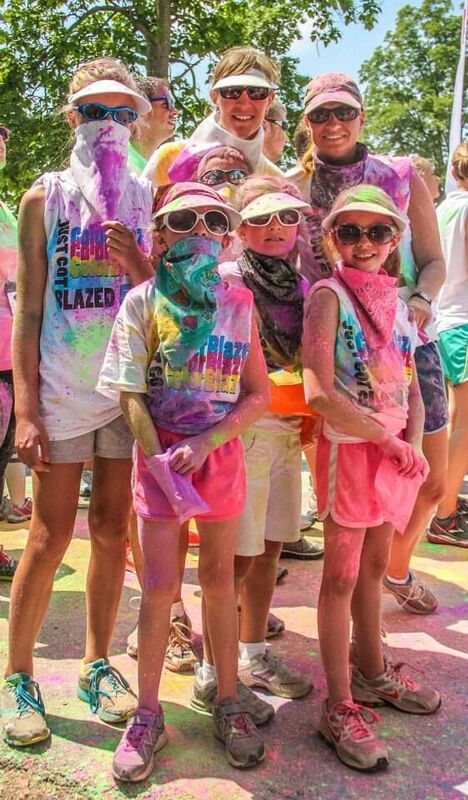 We have detailed instructions on how to keep the color in your color fun run shirt on our blog. Does Color Powder Stain Skin or Hair? Just as with clothing we recommend shaking off all excess powder before exposing to water. Normal soap and water should remove color powder from skin and hair. Some color does tend to linger for a few days especially on blonde hair. If you are worried about staining, we recommend applying a moisturizer to skin and coating your hair with a small amount of coconut or olive oil before the event. Will Color Powder Stain Cement or Grass? Most color powder can be removed from cement and streets with a hose. If needed some liquid detergent and a power washer can help remove the powder. Normal liquid dish detergent and/or de-greaser will remove Color Powder from cement and paved areas. Simply running the sprinklers and/or mowing the grass will remove color powder from grassy areas. Can I Use Color Powder on my School Track? No, you should not use color powder on school tracks. There are many different track surfaces and we can’t guarantee that the color will not stain. We recommend keeping the color powder in a grassy area where the sprinklers or Mother Nature can wash it away. Can I Use Color Powder Indoors? No. Color Powder is intended for use outdoors in a well ventilated area and should be kept away from open flame. What is the difference between bulk color powder and individual color powder packets? Bulk Color Powder is generally sold in 5 pound or 25 pound increments and is used to throw at runners at different stations set up through your color race course. Individual color powder packets are small packets with approximately 2.5 ounces of powder that participants use at the beginning or end of a color fun run to toss in the air and shower themselves and everyone around them with color. Individual packets are also great for photo shoots and pep rallies. What Permissions Do You Need to Hold a Fun Run or Color Race? 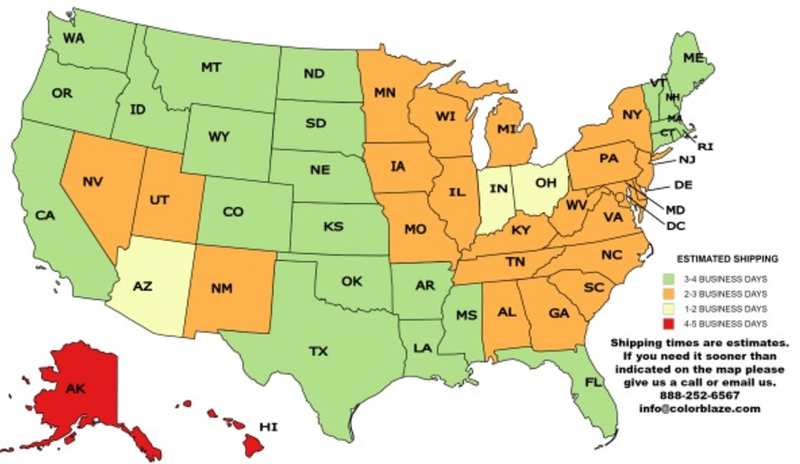 The permissions needed to host a Color Event vary greatly based on your municipality and organization. You should always check with your local school officials and local governments depending upon where you are holding your Fun Run with color. How Long Should Your Color Race/Walk Be? It can be any length you choose! Most choose to do 1 to 3 miles depending on the the age of your participants. Some organizers create a long loop around their school, others have a course run through city streets or parks. In most cases organizers plan on having 3 to 5 color stations. We say the more color the better of course! What Is A Color Station? A color station is a point in your Fun Run that runners pass through and your volunteers throw color powder on them. See our video on the home page for a great example of a color station. How Do You Throw Color Powder on Runners in a Colorful 5k? We recommend using squeeze bottles or small 3 ounce dixie cups. Our customers prefer squeeze bottles because you tend to not waste as much powder and they aren’t quite as messy. You simply fill the squeeze bottles with color powder, point at your runners and squeeze. With dixie cups you just scoop up the powder with your dixie cup and throw it on the runners as they go by. See our blog post with a video on how to set up your color stations and how to throw color powder. Can you use your color powder for a baby gender reveal? Absolutely! Many people order our powder to use at a baby gender reveal party. We have many packages available whether you are planning a gender reveal explosion, gender reveal tire burnout, a car exhaust gender reveal or a fun photo shoot or color toss. We have many sizes and packages to choose from – you can see all the options on our Gender Reveal Shop Page. We typically do not accept returns due to quality control issues and the high cost of return shipping for the consumer. However, in some instances we can make exceptions. Please not any product returned must be unopened in its original packaging, you will need to pay the return shipping costs and there may be a restocking fee. Please contact us for more information regarding returns.